With the mountain of toys on the market today, finding the best toys for 1 year old boys can be quite overwhelming! Your little guy has so many things to discover; sounds, textures, colors, shapes and much more. As a parent, you’re keen to encourage him to explore as many new things as possible. Toys are an excellent way for him to explore and learn about the world around him. They are also a wonderful way for him to create his own adventures through imaginative and creative play. We’re confident that our hand-picked list of the best toys for a 1 year old boy will help you find the ideal gift for that special little guy on your shopping list. The VTech Drop And Go Dump Truck can be pushed or pulled by your toddler and is perfect for any 1 year old boy who loves trucks. This Dump Truck comes with 3 colorful rocks to load and dump, guaranteed to keep your one year old son entertained for hours. Once the rocks are loaded, he can pull the truck around and listen to the fun clickety-clack of the truck bed moving up and down as the rocks roll around inside. As an added bonus, he can listen to lively music as this fun dump truck trails along behind him. To empty the rocks, all he has to do is lift the truck bed. Watch him excitedly chase after the rocks as they roll along the ground when he tips them out! 2 AA demo batteries are included but you’ll need 2 new AA batteries for regular use.This fun and engaging VTech Dump Truck is suitable for both boys and girls. 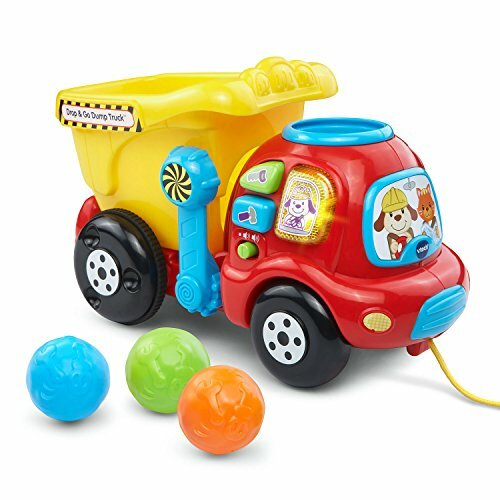 With buttons to push and lots of different sounds, this Dump Truck is tons of fun! Your 1 year old boy will love discovering tons of new things as he sits and explores his very own Fisher Price Laugh And Learn Chair! 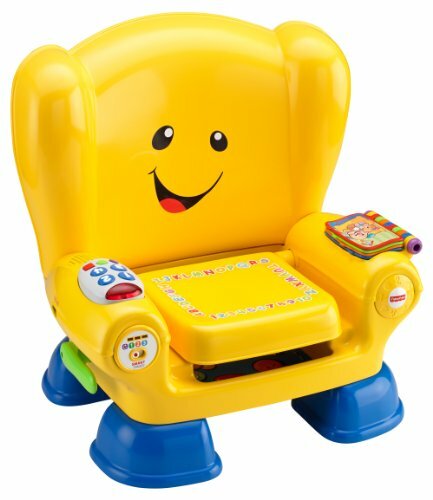 In addition to more than 50 songs, this fun interactive chair also features all kinds of sounds, words, phrases and much more. Featuring Smart Stages technology, this learning chair allows you to choose from 3 different levels so that your son hears age-appropriate learning content. And the really neat thing is that the content changes to match the level you choose so in essence, the learning content will expand as your little boy grows and develops. Level one is the ‘Explore’ stage and it’s designed for kids in the 12-18 month range. When the chair is set to this level your son will hear simple words such as ‘up’ and ‘down’ as well as age-appropriate songs and numbers. Level two is designed for kids 18-24 months and it’s the ‘Encourage’ stage. This level expands on the numbers and counting and also introduces your toddler to opposites and encourages them to get involved in basic activities. Level three is the ‘Pretend’ stage and is geared for kids 24 months and up. Here your child can get involved in imaginative play such as peek-a-boo, hopping like a little frog and many other activities. The seat itself senses when your son sits and stands, activating lots of fun things including ABCs, words and colors. Kids love the arm rests that give them access to their very own remote control and story book. By pressing the buttons on the light-up remote control or turning the pages of the book, your toddler will be asked questions, hear different phrases, numbers and lots more. Plus there’s a convenient little storage space your one year old boy can get to by lifting up the seat cover, allowing him to store small items such as a toy, a snack or a book. This awesome little learning chair takes 3 AAA batteries, which are not included. The VTech Sit To Stand Alphabet Train is a two piece ride on toy. Your one year old boy sits on the second car and holds onto the handle connected to the engine. It is not only a fun toy for your little boy to ride, but it also provides a number of other activities for him to enjoy. There are 13 two sided letter blocks, a built-in book, and plenty of lights and music to keep your toddler occupied. This captivating ride on train requires 3 AA batteries which are included. Children love this colorful train and parents find that this train is not only fun, but extremely helpful to foster your child’s learning and development. The Step2 Whisper Ride II Buggy is a handsome little blue car with a push handle for parents. This is the newer version of an older design and features a sleeker look and style of toy automobile for your little one year old boy. While the older model was really noisy, the redesigned poly soft wheels on this one make for a much quieter and smoother ride. Something parents really love! Toddlers get excited about the steering wheel that actually turns and a horn that beeps. But the nice thing for parents is that turning the wheel does not turn the tires. So you won’t be fighting with your son for control of this great little push car. Along with the 2 cup holders down on the body of the buggy, there’s also a cup holder at the top of the handle, which is convenient for parents. The seat lifts up to reveal a roomy storage area and kids love this ‘secret’ storage area because they can use it for all kinds of things, including snacks and toys. Other great features include a working seat belt that will keep your child safely belted in, and drainage holes in the bottom to allow water to drain out, should the Ride 2 get wet. Although the push handle doesn’t come off, it does fold down and you can tuck it away under the body of the car. This makes it easier to transport when you’re taking it in a vehicle. This awesome push car has cool decals and toy headlights, which will be a huge hit with your little boy. He’ll love pretending to be driving his race car while you’re pushing him to the park, around the block, or anywhere else you want to go! Kids love being pushed around in this toy car! 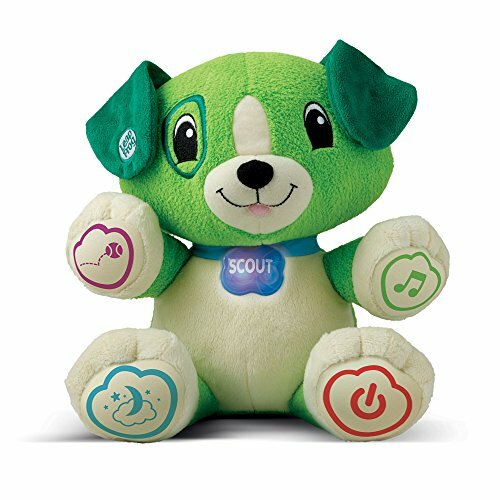 LeapFrog My Pal Scout is a very soft furry dog that can be programmed using your smart phone, tablet or computer to enter in your child’s name and some of their favorite things. This LeapFrog My Pal dog is available in 2 options: LeapFrog Scout or LeapFrog Violet. Scout is green and Violet is a purple so you have great options for both one year old boys or girls. Children love My Pal Scout because this pup can learn their name and then say and spell it out to them. In addition to that, Scout can help your little boy learn colors, counting and age-appropriate words and phrases. This wonderful toy offers kids a wealth of learning opportunity and a ton of fun! This cute toy also has a lullaby timer and you can set it to give your son 5, 10 or 15 minutes of music at bedtime. With Scout, there are 40+ fun and learning songs for your little 1 year old son and 15 different activities that you can personalize to his favorite color, animal and food. The Melissa And Doug First Bead Maze is a fun way to let your 1 year old boy explore his senses of sight and touch. Suitable for both boys and girls, this vibrant toy measures 8.5″ X 7.5″ and has multi-colored beads that your little boy can move back and forth over the red and yellow wires. 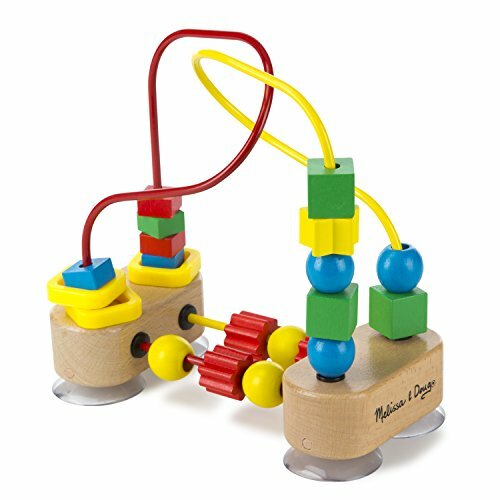 The thick, colored wires intertwine between 2 wooden blocks and suction cups ensure that this toy stays firmly in place while your son plays with it. In addition to 18 wooden beads of different shapes, sizes and colors, there are also 3 plastic spinning rings. All of these parts give your toddler the option of either sliding the beads along the rings and wires or spinning the rings. Each activity helps develop his hand-eye coordination as well as his senses of sight, sound and touch. Your little boy will be enthralled with all the pieces on the maze, moving them around and spinning them! This Melissa And Doug Bead Maze is an ideal way to engage and entertain your one year old boy at home and on the go. The First Years Stacking Cups are another simple, classic and very popular toy that your one year old boy will absolutely love playing with! There are 8 brightly colored stacking cups in total, each with large numbers embossed on the bottom. Designed with holes for water to run out of, these cups are ideal for play both out of the water and in the water at bath or beach time. 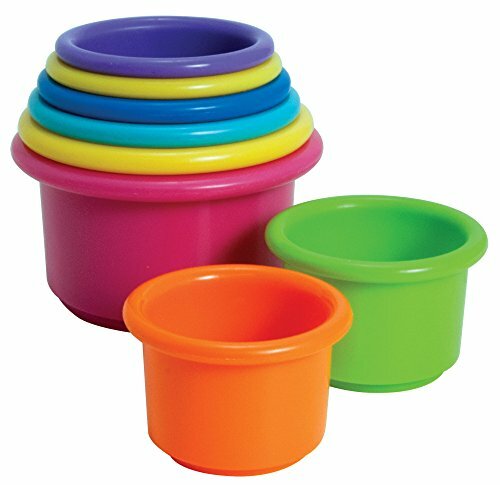 These cups give your toddler endless ways to have hours of creative fun! They can be stacked up, knocked down, banged together, used to builld something, turned over to hide things underneath and they’re dishwasher safe. Plus they’re wonderful for early childhood development skills such as recognition of basic numbers and colors, fine motor skills and hand-eye coordination. Kids of all ages absolutely love playing with them! They offer all kinds of fun, from nesting to stacking them into a tower to turning upside down and more! Your 1 year old son will want you to read this delightful Dear Zoo: A Lift-The-Flap Book over and over again! After more than 30 years, Dear Zoo is still as popular as ever! Dear Zoo is a lift-the-flap board book ideal for toddlers and it is the perfect introduction to books. Its story is age-appropriate, surprising, and features an interactive component that children would surely love. 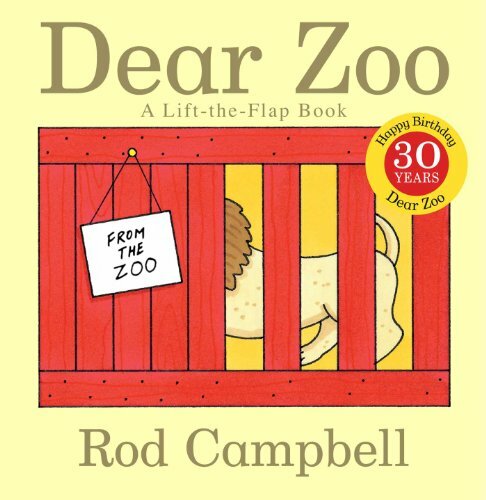 Written by Rod Campbell, a prolific toddler’s book writer and illustrator, this book, which was first published in 1982, is a certified classic, enjoyed by millions of children all over the world. Dear Zoo will surely make your little one giggle with delight with its appropriately written repetitive language. Toddlers usually request to read this fun and interactive book four to five times a day. It is an ingeniously simple book that will enthrall your little boy. It introduces various animals such as the giraffe, monkey, camel, lion, snake, and much more. The surprise ending is cute and suitable for toddlers. As you read this book aloud, he will be enthralled by its colorful illustrations and be visually stimulated with all the animals. Dear Zoo is simply one of the best picture books out there, a must-have for every bookshelf. Your one year old boy will surely have a happy, satisfied smile on his face after reading this. Your one year old boy will just love this wonderful story book! It is a fun and engaging book that even parents love! 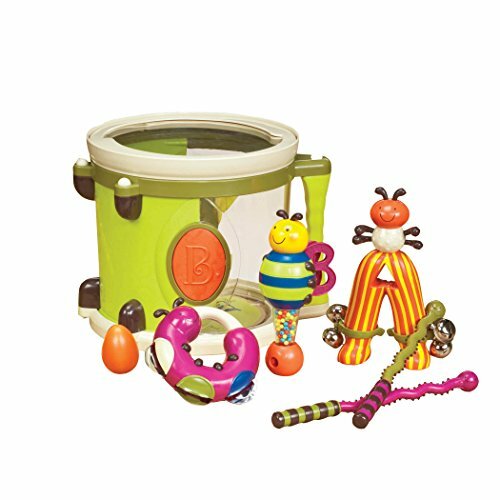 The B. Parum Pum Pum Drum is a wonderful set of musical instruments that your 1 year old boy is sure to love! This drum set includes a colorful snare drum, a jungle bell ant, a bee maraca and clacker combo, a caterpillar tambourine and 2 egg shaped shakers. The drumsticks are charming centipedes which will really catch your toddler’s eye. Watch your little boy squeal with delight as he plays each instrument and hears the sounds they make! The drum set not only has a handle, but it also has a strap to make it easier for your little one to carry. Each of the musical instruments is shaped like a letter, which makes them even more interesting for toddlers. Parents will be delighted to know that everything stores right in the drum so it’s each to keep the playroom tidy. 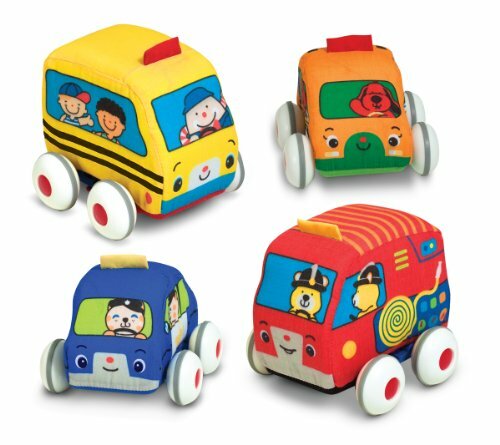 The Melissa And Doug Kids Pull-Back Vehicle Set consists of 4 soft fabric vehicles including a school bus, car, fire truck and police car. Your 1 year old little boy will love pulling back each vehicle and watching them zoom across the floor! With these awesome little vehicles, a little effort goes a long way. Each vehicle is brightly colored to capture and hold your child’s attention. And the addition of goofy characters inside the vehicles makes for even more fun. Watch as your little guy engages in imaginative play, pretending to be a policeman, school bus driver, fireman and maybe even mom or dad driving the car. Velcro holds the car body to the wheels so you can remove the wheels, wipe them down and throw the cloth vehicles into the washing machine for easy care and maintenance. These cute little vehicles are easy for small children to lift and roll and they’re the perfect gift for your one year old toddler. Kids love these little cars and find them cute and fun! Little boys are totally fascinated by recycling trucks, so what could be better than giving your 1 year old son his very own Green Toys Recycling Truck? This is an ideal toy to engage your little guy in interactive pretend play because it comes with recycling chutes on both sides and a bed that tilts back. On top of that, the rear doors open and shut. How awesome is that! The packaging features cardboard pictures of recyclable material including a newspaper, a plastic bottle and an aluminum can. All of them can be cut out and used with the truck. Each of the side chutes are labelled for cans, paper and bottles so your son can learn the basics of recycling while having a ton of fun. Once your little boy has learned which cardboard cutout goes where, he can load them up and tilt back the truck bed. He’ll be fascinated as he watches his load drop out! 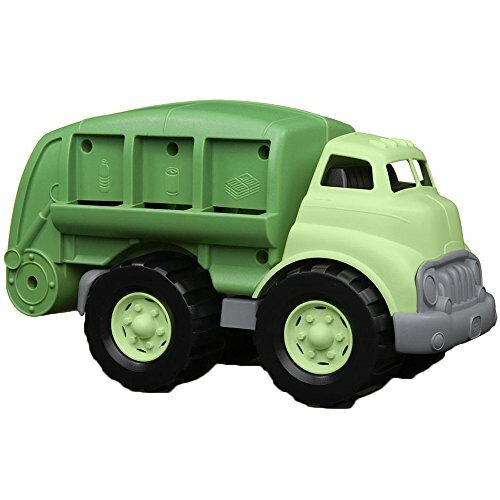 As with all Green Toys, this truck is made in the USA from recycled milk cartons and is Phthalate and BPA Free. It’s the perfect any-occasion gift for your 1 year old child. Kids love all the cool things this little truck can do! With the Green Toys FlatBed Truck And Race Car your 1 year old boy gets two colorful toys in one! He gets the vibrant flatbed truck and a bright red race car already loaded. To unload the car, all he has to do is tilt the flatbed back and the car smoothly rolls off. Your child can play with each toy separately or load the car and play with both together. Perfect to play with indoors or out, both the toy truck and the toy car are made in the USA from recycled milk jugs. In addition to that, these Green Toys vehicles contain no metal axles and are BPA, PVC, and Phthalates Free. This flat bed truck with race car makes a wonderful gift for any one year old boy on your shopping list. 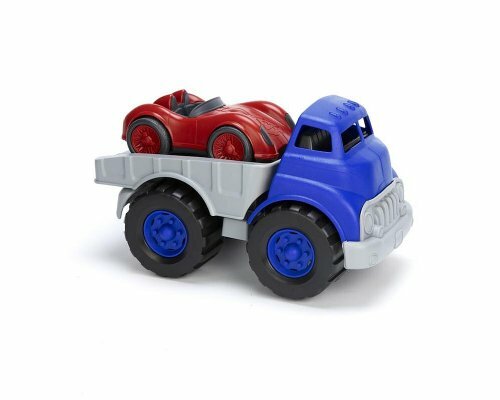 This truck and car set will deliver endless hours of fun for your little guy! He gets 2 vehicles in one – a wonderful surprise! 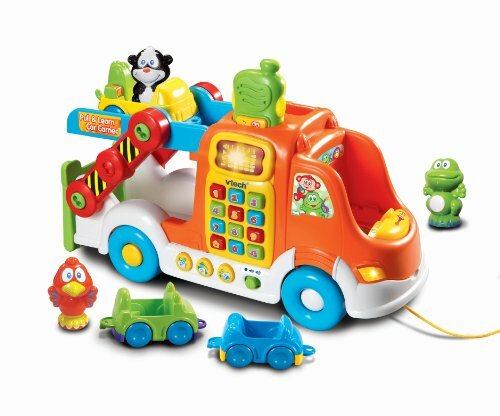 The VTech Pull And Learn Car Carrier is an interactive pull toy that offers your one year old boy a variety of fun things to learn and do while encouraging the development of their fine motor skills. This wonderful pull toy comes with 3 fun vehicles and 3 cute animal characters that all fit into the Car Carrier for convenient playtime and storage. And it has easy to press buttons that will help your son learn colors, numbers and animals. Other great features include a CB radio and a ramp that flips down for easy vehicle loading. A built in motion detector on the back of the truck will identify each vehicle as they roll over it, plus the little cars will recognize each animal when they are snapped into the driver’s seat. It requires 2 AA batteries which are included. 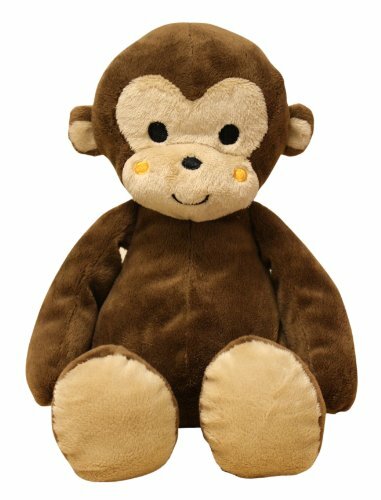 Bedtime Originals Plush Monkey Ollie is a cute brown monkey with a curly tail who is about 8” tall and machine washable. He’s soft, cuddly, has a two tone color and a cheeky grin! With soft stitched eyes and mouth, Ollie is perfectly safe for one year old boys and would be a wonderful addition to any nursery. He also makes a terrific birthday or Christmas gift. Perfect for either boys or girls, both parents and 1 year olds love this adorable monkey! 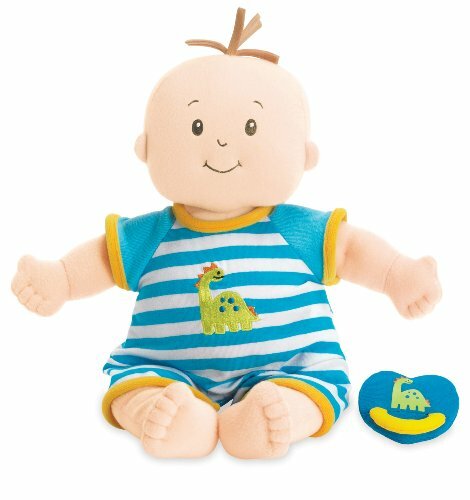 This award-winning adorable Baby Stella Boy Doll by Manhattan Toy makes a wonderful playtime buddy for any 1 year old boy or girl! With a cute tuft of hair, this doll measures 15″ and comes dressed in a sweet little onesie with a removable cloth diaper. With an embroidered mouth, nose and eyes, your toddler will delight in this handsome little guy’s life-like fingers, toes and plump belly. This Baby Stella Doll also comes with a magnetic pacifier that attaches to his face and will make your son’s pretend play tons of fun. Your little one year old boy will enjoy naming his new friend, bonding with him, talking to him, hugging him and so much more! He’s soft and cuddly and cute as can be! The Mega Blocks First Builders Build ‘n Go Wagon comes in blue and pink so it’s ideal for both boys and girls! 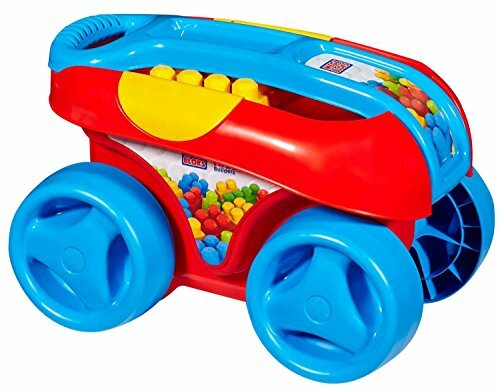 This easy to pull wagon is filled with 25 large colorful blocks that your little 1 year old boy will enjoy loading and unloading. This wagon is safe, colorful and lightweight. And even with all 25 blocks inside, there’s still room for even more blocks or other toys inside. The chunky tires have been specially designed with durability in mind so that this pull toy is designed to last. And the Build’N Go Wagon is suitable for play almost anywhere, be it at the beach, in the garden or in the playroom. Your little guy will have a ton of fun building something with the blocks, knocking his creation down and then building it up again! Melissa And Doug Alligator Walker The Melissa And Doug Alligator Walker Push Toy is a colorful wooden walker that features 3 hungry alligators that chomp away as your child pushes the toy. As with all Melissa and Doug toys, the attention to detail on this Melissa And Doug Alligator Walker is wonderful. From the cute little fish on the wheels, to the spinning ladybug and butterfly beads, to the cattails on the handle supports, they’ve designed this push toy to be lots of fun for your 1 year old boy. 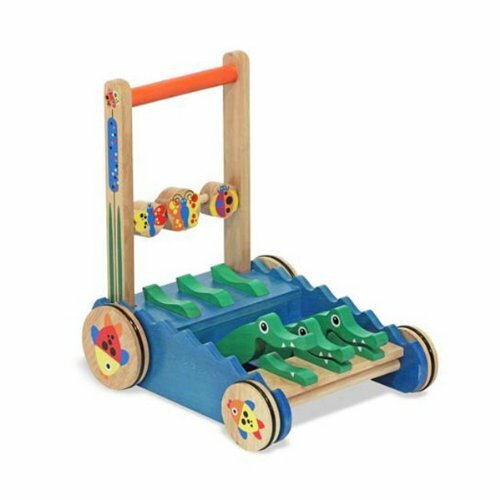 This sturdy wooden push toy is a great way to encourage movement and discovery in your little boy, while at the same time promoting balance, agility and exercise. The paint is child safe and the wheels are non-skid, making this push toy for 1 year olds very safe for your little son. A push toy that makes a lot of noise is always a big hit with kids and these chomping alligators are sure to delight your child as he pushes the toy around. This action-packed, interactive Fisher-Price Laugh And Learn Learning Workbench has lots of features that will surely fascinate your 1 year old little boy and provide hours of entertainment and learning! Watch your little son work and play as he explores the dancing drill, spinning vise, twirling paint roller, count-and-slide ruler, rattling hammer and three light-up pegs. As your boy pounds on each giant colorful nail, they light up, highlighting the three primary colors of yellow, blue, and red. The detachable, light-weight hammer is used to pound the nails. Your boy can sing along to the counting song that plays as each peg lights up. This Learning Workbench teaches your child alphabet, counting, shapes, colors, opposites, and actions. Auditory stimulation is also heightened with 15+ sing-along songs and tunes. It also has lively music, fun sounds, and phrases. And parents love that it has a volume control for quieter play. This toy has everything a little toddler loves, including adorable, child-friendly characters. In addition, playing with the Learning Workbench is a great way for your little one to develop his gross motor and fine motor skills. The Fisher-Price Learning Workbench comes with an instruction manual and 3 AA demo batteries, which will have to be replaced for normal use. It’s a wonderful toy that allows your child to drill, tap, pound, spin, and slide to his heart’s content! Fantastic fun educational and interactive toy for your little boy! There is something about a moving vehicle that delights little boys. The Little Tikes Cozy Coupe is the perfect 1st birthday gift for active boys. 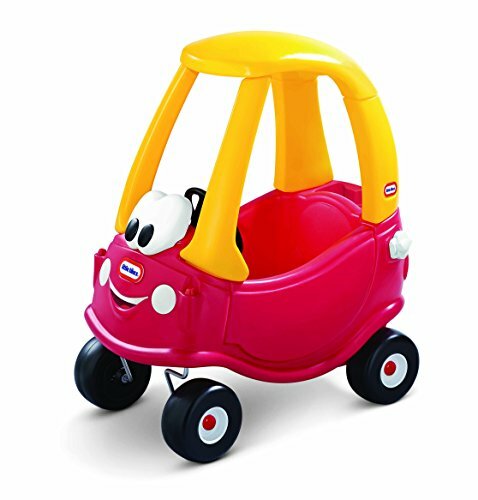 Brought to us by Little Tikes, known for making durable toys for active play, this Cozy Coupe is celebrating its 30th year. Being one of the original ride-on toys ever, it still manages to delight and enthral little one year old boys. It is surely a classic family favorite. 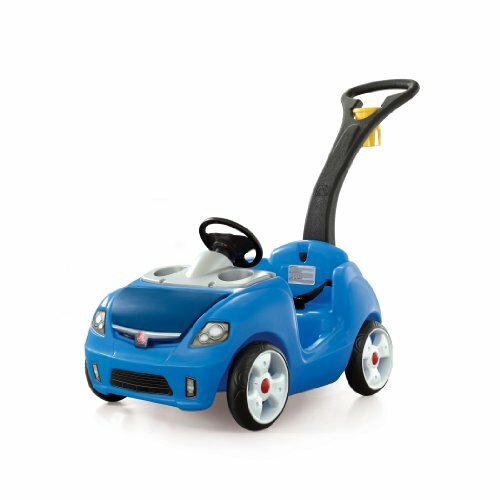 The design of this ride-on toy car is ideal for your little son – it has a high seat back, an ignition switch, a real working horn, an interior door lock, a cup holder, and an open-and-close gas cap. A new feature is a handle on the back for parent-controlled pushed rides. Its storage in the rear allows your son to keep his favorite toys, snacks, and a water bottle. The tires are durable and safe, and its front wheels spin 360 degrees, making it more exciting to drive. Your son will enjoy his ‘ride’, whether it’s inside the house or in your driveway. It is also designed to grow with your boy. A brand new upgrade, especially made for its 30th birthday, is its removable floor. The floorboards inside the car are in place for parents to push the car, and when you remove the floorboards, it transforms into a child-powered car. This is ideal for your one year old boy as he transitions to toddlerhood. He will love to drive his very own car, with an open-and-close door and a friendly face. This toy requires assembly and the weight limit is up to 50 lbs. One year old boys just love it and it makes a fantastic birthday or Christmas present! 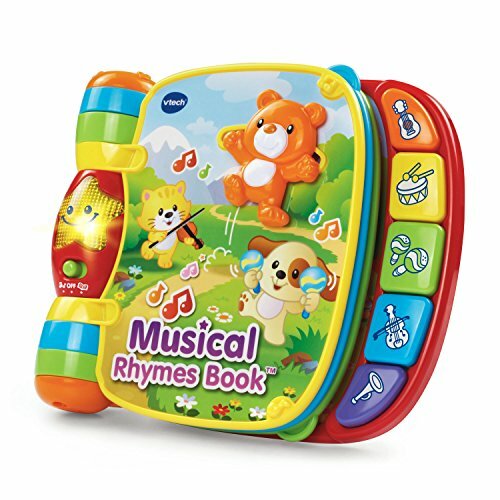 This interactive VTech Musical Rhymes Book will delight your little one year old boy as he learns nursery rhymes and develops early language skills! This Musical Rhymes Book features big, easy-to-turn pages which are perfect for your son’s little hands. There are two modes of play for him to enjoy: music mode and learning mode. With 40+ songs, phrases, melodies, and various sounds, this fun early learning book has lots to engage and captivate your child. It also features five different colored piano buttons, each one playing a different note. Stimulating to the eyes and ears, it has bright, colorful pages with child-friendly illustrations and a delightful star that lights up. The book comes with six classic nursery rhymes that your 1-year old boy can learn: A-Tisket A-Tasket, Little Boy Blue, Old MacDonald Had A Farm, Hey Diddle Diddle, Are You Sleeping and Here We Go Round the Mulberry Bush. It also has a volume control which parents love! No assembly is required and batteries are included. VTech is a global supplier of electronic learning toys, well known for their innovative and child-friendly products and this one is no exception. It’s the ideal size for little kids and your son will enjoy playing with it until he’s about three years of age. A wonderful fun book for your one year old son to enjoy on his birthday! Pretend play has never been so much fun as it is with the VTech Turn And Learn Driver! The Turn And Learn taps into your little boy’s natural interest in modes of transportation. 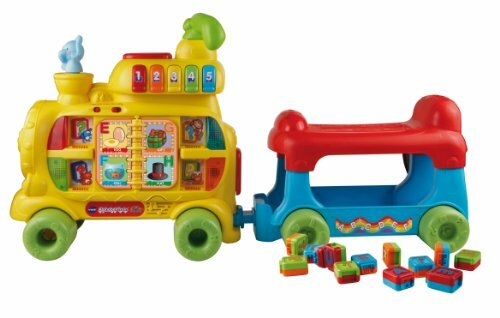 It features five colorful buttons, each one highlighting different kinds of vehicles, including a fire truck, police car, school bus, delivery truck, and ambulance. The fun design also includes a traffic light, a side mirror and a signal lever that activates entertaining sounds and music. It also has a gear shifter that your little boy can push and pull, introducing him to the concept of opposites. There are three play modes for your little boy to choose from: driving mode, music mode, and animal mode. And he can listen to 60+ songs, melodies, sounds, and phrases. The red steering wheel is the ideal size for your son’s little hands, and as he steers it, the cute dog character moves back and forth. He’ll also love pressing the cute green horn. There’s an on/off switch and a volume control switch and this VTech toy requires 2 AA batteries (included). In order to preserve battery life, the toy turns off automatically after 50 seconds of inactivity. Your son can enjoy playing with this top-rated, best-selling toy from a few months before he’s a year old for a number of years offering great value for money. As your little boy turns one, this is the perfect toy to engage and delight him on his birthday! Brilliant interactive fun toy for your one year old son’s first birthday! 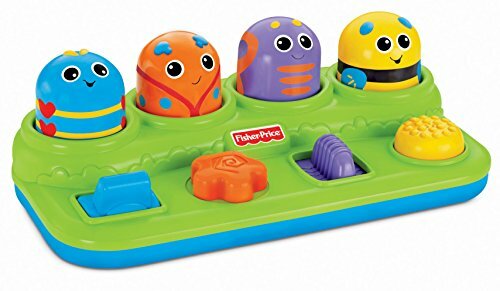 This Christmas, your 1 year old son will truly be delighted when you give him this super fun and adorable Fisher-Price Brilliant Basics Boppin’ Activity Bugs Playset toy that features four cute smiling bugs! Now that he is able to grasp and hold a lot of things, your little boy will love to manipulate objects using his little hands. In fact, when one year old toddlers bang, pull, bop, and press an object, it is considered a huge developmental leap. They especially love holding and manipulating objects that make a sound. With toddlers in mind, well-known toymaker Fisher-Price brings us Brilliant Basics Boppin’ Activity Bugs Playset. When your little boy pulls, turns, slides, and presses four colorful buttons, four friendly bugs pop up. The concept behind this toy is very simple, but it does its job of introducing basic concepts to young children. As each bug pops up, your son will hear a bobbling action and fun sounds. Each knob features four different activities to explore. Your little toddler boy will pull the blue button, turn the orange button, slide the purple button, and press the yellow button. All four buttons can go up and down and your little guy can also bat at and push down the four little bugs. The Boppin’ Activity Bugs Playset requires no batteries – it is entirely toddler powered. And your son’s action makes things happen, so it’s a perfect cause and effect toy. It’s also light enough for your child to carry around – the ideal companion when you’re on the go. Your active little boy will surely play with this toy for hours on end and he can enjoy it right up to his preschool years. Toddler boys really love it as they love anything bug related! It is simply a fun and engaging toy that you can enjoy with your little guy! If you’re looking for a gift idea for your one year old son, then the LeapFrog Chat And Count Smartphone guarantees hours of fun and learning! 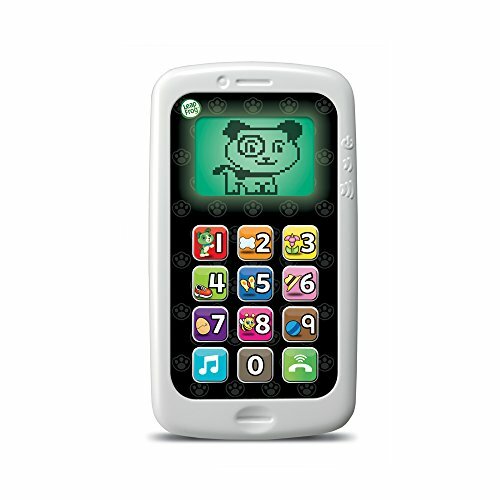 Brought to us by LeapFrog, the leader in innovative and interactive electronic activities for children, this Chat and Count Smartphone is geared towards your child’s cognitive and language development. This toy is a great way to introduce your little boy to digital media and technology, as it features fun learning within a smart little phone. And just watch your little guy imitate adults talking on their smartphones! It has songs about counting and more than 15 smartphone activities. When your little toddler pushes the call button, he can pretend to exchange calls and voicemails with Scout, his very own puppy pal. When the music button is pushed, your little boy can sing along to songs about counting, phone manners, and more. For customized learning, parents can register to the online LeapFrog activity zone. There are fun animations that appear on the screen, and a special counting song introduces numbers 1 to 10. When your little guy presses any number button, an animated Scout will appear and count it in a fun and engaging way. The Chat and Count Smartphone is just the right size and weight for your little boy’s hands. 3 AAA batteries are included in the pack. Your one-year-old son will be able to enjoy this toy until his preschool years. Toddler boys just love Scout and your son will be the same! It is an engaging toy smartphone that your one-year-old boy will love! Your one year old boy will surely love playing with this Nuby Octopus Hoopla floating bath time toy. This is a cleverly-designed lightweight toy that engages little ones while they are in the tub or pool. Little children naturally love to play with water. Giving your toddler son a water or bath time toy for Christmas or his birthday is a great idea. Bath time toys not only entertain children while they’re taking a bath but also while they’re in the pool. 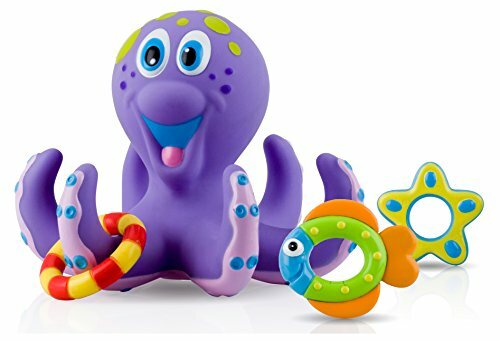 This cute Purple Octopus bath time toy has three colorful and creatively-shaped rings to toss – one is shaped like a star, the other one a fish, and the last one is a regular yellow and red ring. All the toys float in water, making bath time or pool time more enjoyable! Nuby is a trusted brand dedicated to toddlers with a simple goal of making the lives of parents and todlers easy, simple and fun. All Nuby toys are 100% BPA free. These bath time products retain their colors because they are specially made to be in the water. Your little 1 year old boy can choose to play with just the Octopus or just the three hoops or play with all of them altogether. No matter which choice he makes, he is going to have lots of fun and enjoyment! Give the Nuby Octopus Hoopla Bathtime toy to your water loving son this Christmas. It will surely make bath time much more stimulating and pleasurable for both him and you! Toddler boys love Nuby the Octopus for both bathtime and pool time! 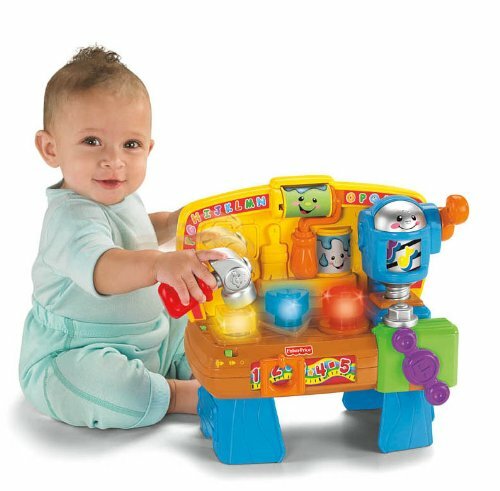 Playskool Explore ‘N Grow Busy Gears lets your little guy learn various concepts in an interesting and developmentally-appropriate way and is a great gift idea for any one year old toddler boy. 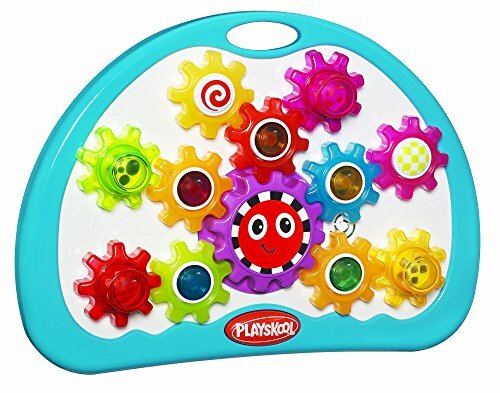 Brought to us by Playskool, a well-known company that produces educational toys, Explore ‘N Grow Busy Gears is an excellent learning toy for young boys. This toy has stood the test of time. It has been around for 10 years and it’s still a popular holiday gift for toddler boys. It features a colorful set of gears that spin as twinkling lights flash and fun music plays. When your little boy presses the button, the gears spin and swirl and the lights twinkle. The cogs or gears are colored brightly and are interchangeable. The gears are also removable and can be stacked, sorted or arranged in a row by your little ones. One great thing about this toy is that it has unlimited possibilities. There are many ways to use and play this toy. Once your son gets used to it, he will begin to think of new ways to arrange and re-arrange the gears. By the time he gets to preschool age, he is able to create various ways for the gears to work. This toy is so well-made that it could be passed on from one sibling to the next. The hands-on toy comes with 11 gears and instructions, plus 3 AA batteries. 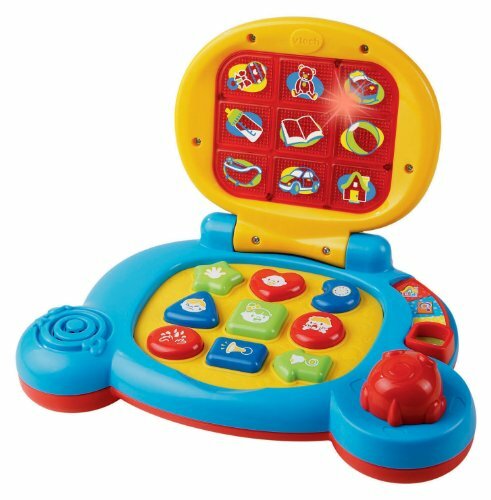 If you have a one year old son, consider giving him the VTech Baby’s Learning Laptop this Christmas. This educational toy is a perfect gadget to start introducing your little boy to computers and technology. 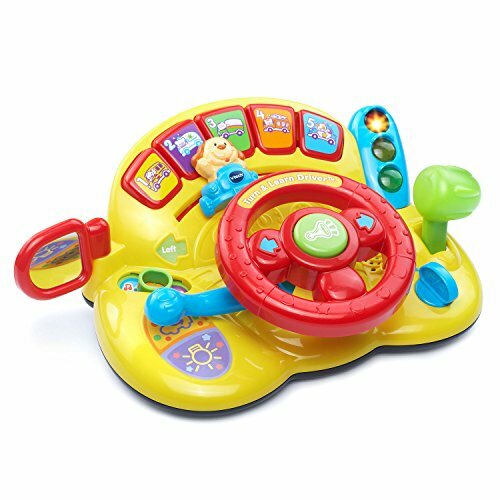 This Vtech Baby Laptop features three modes of play: the Learning mode, the Discovery mode, and the Music mode. In Learning mode, when your son presses the shape button, the name of the shape is identified along with a short tune. In Discovery mode position, your little boy can hear friendly phrases, fun sounds, and songs. In Music mode, different musical melodies are played when the shape is pressed. This laptop also has an engaging light-up screen. It also comes with a moveable mouse that simulates a real laptop. Moving the mouse changes the lights on the screen. The mouse is able to move in eight directions and the light patterns on the screen will follow. The mouse is perfectly-sized for growing toddlers. Your little boy’s senses will be stimulated because the early learning center comes with over 90 sing-along songs, music, different sounds, and phrases. Your toddler will enjoy this toy until his preschool years and it will keep him occupied for hours. And because it’s small and lightweight, you can easily take it with you on long trips to keep your little guy entertained. It requires 2 AA batteries (included) and to preserve battery life, the toy laptop will automatically power down after 30 seconds of inactivity. Great Christmas gift idea for your one year old toddler as boys loves gadgets, even at a very young age! It aids in language development as it teaches your son early learning concepts such as names of objects, phrases, and feelings. 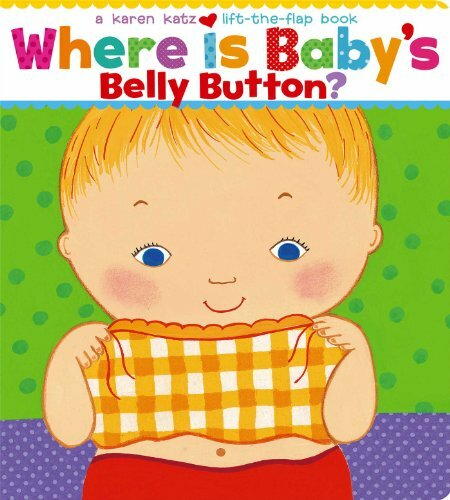 Where is Baby’s Belly Button is a Lift-the–Flap board book that is a consistent number one bestseller in the Children’s Interactive Adventures category. First published in 2000, this collaborative hands-on book will surely engage your active young boy as he explores his body parts. One year old boys are naturally energetic and active. Because everything is new to them, they love to explore and interact with things around them. They are naturally curious and enthusiastic about the world. A child’s first year is an exciting year of new discoveries, and one of the things he is discovering is his very own body. This is the reason why Karen Katz’s Where Is Baby’s Belly Button is the perfect Christmas gift for your son’s first year. It is an appropriately worded board book, featuring adorable babies playing peek-a-boo. It is exactly the sort of thing that would delight little boys because they love playing peek-a-boo themselves. The 14-page book has a sturdy format and easy-to-lift flaps. Author Karen Katz has written and illustrated more than fifty picture books, and Where is Baby’s Belly Button is a certified bestseller. It is a consistent top pick of parents, teachers and children, touted as one of the best books for one-year-olds. Your little boy will enjoy this book until his preschool years. He will start by asking you to read it again and again, and will still love it until he can read the words himself. Why We recommend Where Is Baby’s Belly Button?